In earlier articles, we’ve covered the true beauty of going surfing at Kata beach. We told you a thing or two about our experienced, fun-loving, multilingual, passionate and awesome staff, which we couldn’t be without. We also told you about the waves, the rich variety of them, one of plenty for surfers of every skill level. At Phuket Surf school you can’t only learn to surf though. If you already are an experienced surfer and don’t need the lessons, then there you are left with other options as well. Instead of taking part in our surf lessons, why not rent a board instead? 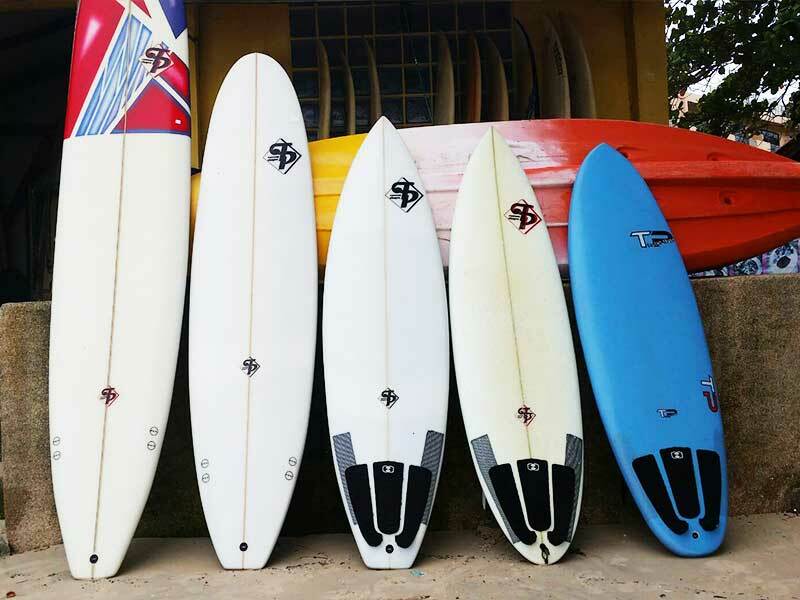 At our partner store, Surfshop Nautilus, you can rent a large range of boards. There’s one for every skill level, one for any age or gender. From surfboard to stand Up Paddle, Boogie boards, Skimboards to Kayaks – it all can be rented right here starting from THB 150-500 per hour. If you’d rather prefer to have your own flexibility of where and when to ride your board or kayak, this is a great opportunity for you. If Stand Up Paddling sounds fun to you, but you’ve never tried it, come take a lesson with us and join other enthusiastic novices on the board. Like with surfboards, you can get lessons right here at the shop. Whether it is for beginners or as a fresher up, you’ll find every need catered to at Surf School Phuket and Nautilus Dive & Surf Phuket. Are you ready for this new experience? No matter if you’re looking to try a surfboard, a boogie board, a skimboard or would like to try out a ride on the waves with a kayak, we have the latest boards and boats in store, so you can endeavour on adventures on the waves. Kayaking is perhaps not the most common activity you might think about when visiting the beach, but who said that kayaking needs to happen right at the beach? You can explore cliffs, islands and the rich sea life around the area and makes this a true adventure together with your family or friends. Not only do we teach you how to surf, rent our boards out for your individual use and purpose, we also sell brand new, hand-shaped boards at our shop. Apart from that, you’ll also find a large array of accessories at our shop. No matter if you find yourself in need of waxes, leashes, surf shirts, patches, fins and much more – you’ll find it all right here in our shop. Should your board be damaged after a ride, or your kayak has a leak, let us fix it. Not only do we fix boards in record time, we also make sure to do it without blowing your budget. All you need to do is to bring your boards to us, and let us take a look at it. Before you know it, your board is fixed and you’re all ready to ride the waves again! No matter your unique needs, level of experience, age, fitness level – if you feel like surfing, we make it possible for you – affordable, easy and without any surprises or cutbacks. Come visit our shop and share the rich adventure of going surfing with us. Only when you’ve experienced the waves, you know the true magic and thrill, the feeling of freedom and tranquility it gives you. You need only three things in order to go surfing: Your body, a surf-board and a wave. Allow us to take care of the board for you, ready your body and take you to the rich variety of waves around Phuket.